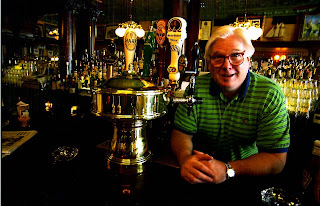 Royal George, 1641 N. Halsted, opens its doors at 7:30 p.m. on Monday, April 19, 2010 in honor of Michael Cullen, owner of the Mercury Theater and Cullen’s, and a 35-year veteran producer and pioneer in the development of Chicagoland theater as it is known today. Recently suffering from a stroke, Mr. Cullen requires extensive therapy treatments. The entertainment line-up is still to be announced for this event. Michael Cullen began his artistic journey through part of his graduate program at the Goodman School of Drama where he founded the Travel Light Theater Company, one of the first off-Loop theater companies. Starting with ten actors Travel Light grew into one of the more prominent and well-known theaters. During the Travel Light years he independently produced over eighty productions. He was one of the co-founders and developers of the Theater Building located 1225 West Belmont Avenue in Chicago where Travel Light Theater found a permanent home. Here he produced such shows as Lone Star with Sigourney Weaver, Woody Guthrie featuring Tom Taylor, Gracie directed by Austin Pendelton and featuring the acclaimed Steppenwolf Company. It received four Joseph Jefferson Awards and a PBS airing. During this same time he helped found the League of Chicago Theaters. Some of Mr. Cullen’s independent productions along with partner Arnie Saks, include the Midwest premiere of I’m Getting My Act Together and Taking It on the Road starring Gretchen Cryer. It became the longest-running show at the Drury Lane Water Tower Theater, spanning 1 ½ years and winning six Joseph Jefferson Awards. His premiere of Tintypes played a record breaking run at the Apollo Theater Center and earned six Joseph Jefferson Awards. At the Goodman Theater he presented Lily Tomlin in Lily Tomlin; Appearing Nightly. He brought Mary Wilson and the Supremes, Barbara Cook, and Tommy tune to the Royal George for a series of concert appearances. He served as Associate Producer for the Broadway production of Speed of Darkness by Steve Tesiech directed by Robert Falls. It received four Tony nominations, winning a Best Supporting Actor Tony for Stephen Lang. In 1984, Mr. Cullen along with his partner Sheila Henaghan, formed Cullen, Henaghan and Platt presenting Pump Boys and Dinettes which ran for 4 ½ years and on May 16, 1988, became the longest running musical in the history of Chicago Theater. In 1986, Mr. Cullen became involved with development of the Royal George Theater. In addition to those already mentioned, Cullen, Henaghan and Platt over a ten year period brought to Chicago productions of Shirley Valentine, Driving Miss Daisy, Steel Magnolias, I’m not Rappaport, A… My Name is Alice, Jeeves Taking Charge, The Nerd, Frankie and Johnny in the Claire du Lune, and Some Things You Need to Know Before the World Ends: A Final Evening with the Illuminati. In New York at the West Side Arts Theater they produced the off-Broadway production of 21A. In addition to those already mentioned, Mr. Cullen has worked with such stars as Charles Nelson Reilly, Loretta Swit, Ellen Burstyn, Kathy Bates, John Astin, John Mahoney, Estelle Parsons, and George Peppard. In 1994, Mr. Cullen along with his partner, Joe Carlucci, purchased the property at 3741-3747 North Southport, which they developed into three businesses. Mr. Cullen owns and operates the businesses known as Cullen’s Bar & Grill and The Mercury Theater. The Mercury Theater has presented a wide range of theatrical productions from the musical, Pope Joan, to the three man comedy Triple Espresso and has hosted many popular one man shows such as His Way, The Male Intellect, An Oxymoron, Jown Astin’s Edgar Allan Poe show. The Tony Award winning comedy The Last Night of Ballyhoo enjoyed a long run as did, Frank McCourt’s The Irish and How They Got That Way. Also the Mercury Buckminister Fuller, the History and Mystery of the Universe, Barry Manilow’s musical review Could It Be Magic?, Over the Tavern, Over the River and Through the Woods, and most recently the award winning Belfast Blues, currently running off-Broadway. Organizers are suggesting a $50 to $75 donation. For more information or to donate directly, please visit www.michaelcullenrecoveryfund.org.